PEN International is a worldwide association of writers. One of its main goals is to fight for freedom of expression and to act as a voice on behalf of writers harassed, threatened, attacked, kidnapped, imprisoned, tortured, and sometimes even killed for their views. PEN International Writers in Prison Committee was established in 1960 to represent persecuted writers. Day of the Imprisoned Writer was instituted to support writers, journalists, bloggers, and activists who are persecuted for their views and have to resist repression of their right to freedom of expression. Every year, PEN International uses the event to draw attention to several specific writers and their individual circumstances of repression. On November 15, the general public is encouraged to take action on behalf of the selected writers, typically in the form of letters of appeal and donations. 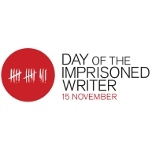 Day of the Imprisoned Writer also aims to commemorate all the writers who have been killed in circumstances related to their professions since the previous year's event.